Tá an scoil ag glacadh páirt sa chomórtas athchúrsála WEEE ar son LauraLynn, Ireland's Children's Hospice. Tá bosca atchúrsáil cadhnraí WEEE i ngach seomra ranga. Tá fáilte roimh na páistí sean-cadhnraí a thabhairt isteach as seo amach. The school is participating in the WEEE pledge recycling challenge, in aid of LauraLynn, Ireland's Children's Hospice. 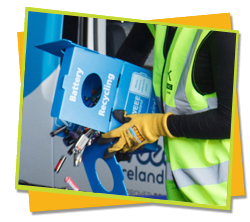 There will be a WEEE battery recycling box in every classroom. The more batteries we collect, the more prizes we win! So every pupil is welcome to bring in as many old batteries as they can for the foreseeable future.